Mike and I moved into our present home in August 2008. It is a semi-detached house at the top end of a cul-de-sac containing 35 houses – all but one are semi-detached. The garden had been sadly neglected although, over 30 years ago, it was the pride and joy of Mike's Grandfather, Albert, (right) and the lawn was like a bowling green as can be seen in the photo. The houses were built in 1934 and Mike's grandparents bought it in 1935 – it has been in the family ever since. As we didn't know whether we would be staying at the house for any length of time, and neither of us had any interest in gardening, we kept the lawn mowed and, in the summer of 2009 we attempted to convert the rockery into an alpine garden and as we had a new fence erected between us and next door we revamped the bed adjacent to it. However, this soon got neglected. 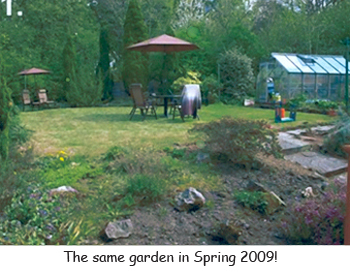 In 2010, having decided we were going to stay at the house, we felt we ought to attempt to do something with the garden as it really was becoming an eyesore. As we are at the end of a cul-de-sac we have one of the largest gardens in the avenue which, at the time of moving in, was a downside! 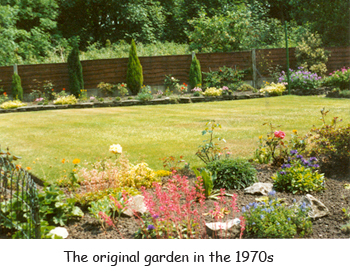 The garden became a major talking point between family, friends and neighbours and they were often asking to see photographs of its progress. I posted a lot of the photographs on Facebook but not everyone is on Facebook so I had the idea of setting up a website specifically on our garden so that everyone could see it. 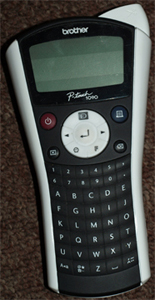 The website was started in 2012 and was kept up to date until 2016. In April 2018 I am going to start to update At the bottom of each page it reads "Web Design © 2012-2016.....". As each page is updated the date will change to "2012-2018". Section 1 consists of eight main areas of the garden – The Garden, The Greenhouse, The Patio, The Pond, The Koi, The Archway, The Side Garden and The Front Garden. Each of these pages has photographs and information but, in addition, The Garden, The Patio and The Pond also have a complete Photo Album showing photographs from start to finish of each project. Section 2 has a page for each species of plant where there are individual photographs together with a few details of each tree, shrub or plant. Section 4 is a page which was added in March 2014 when I realised that my collection of Orchids had begun to creep up on me. As these are kept in the house I thought it would be better to put them in a separate section. 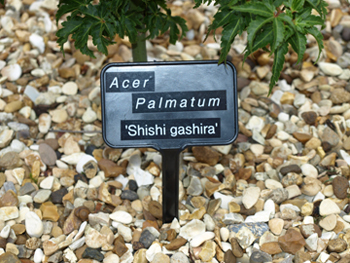 In order to help us remember the names of plants and, during the winter months, to remind us where things are planted, we decided to label all the plants, shrubs and trees. We tried a few methods but finally settled on the system shown in the photo (right) using a Brother P-touch 1090 labelling machine (left). The labels (medium black angled-head) are purchased from The Essentials Company, the Brother labelling machine from Staples, and the labelling tapes (12mm white lettering on black tape) from Printerbase Ltd.
We are sure that many of you will say that we should have done things differently but, nevertheless, we hope you enjoy following our progress and please bear in mind – even 8 years on we still class ourselves as novices where gardening is concerned! I would like to dedicate this website to my Mum & Dad who died in 2011 (aged 99) and 1985 respectively. 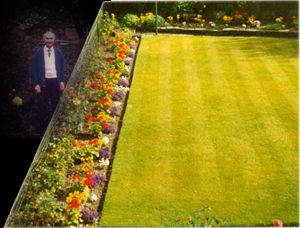 Their gardens were absolutely perfect and I know they would be very proud of what we have achieved – especially knowing that I showed no interest in gardening at all when I was a child! Also, to Mike's Grandfather who, clearly, had a beautiful garden.